Are details more important to you than they are to most people? If so, you may want to take a close look at the rentals in this category. These homes are some of our most luxurious vacation rentals. Cascade Cornerstone East, in the heart of Grand Marais, MN, is the perfect vacation rental for extended stays. Cascade Cornerstone West is a modern long term vacation rental located in the heart of Grand Marais, Minnesota. 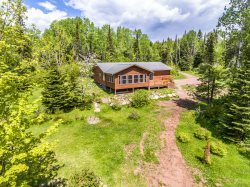 Enchanted Shores is a spacious vacation home on the shores of Lake Superior in the town of Hovland, MN.